Falkland Islands in the CIA World Facts Book. The flag actually changed in appearance this year (1999) when the Ministry of Defence changed the specification for the placement of badges on ensigns. The size of the badge was increased considerably (200% - 300%) and all white discs were removed. The badges are now more like major charges on the field rather than small augmentations. In the future, if one of these flags needs to be differenced (e.g. the Falkland's Police ensign - which doesn't actually exist) the second badge will sit in the centre of the third quarter. The The Merchant Shipping (Falkland Islands Colours) Order 1998 was made on 16th December 1998, laid before Parliament on 4th January 1999 and coming into force on the 25th of January this year. I am a bit puzzled by this change of size in the badges. Does the United Kingdom Ministry of Defence have the authority to change the flags of the dependencies? I mean, if I am not mistaken the Falkland Island red ensign was adopted through the "The Merchant Shipping (Falkland Islands Colours) Order" which was approved by "The Queen's Most Excellent Majesty in Council." I guess there will be similar legislation for other dependencies. Can the UK Ministry of Defence just overturn such legislation? I think that the Ministry of Defence has inherited the right of the Admiralty to indicate how the badges should be displayed on a flag. The flags actually used are not necessarily the same as the drawings in even official flag books, so perhaps no one will be surprised. 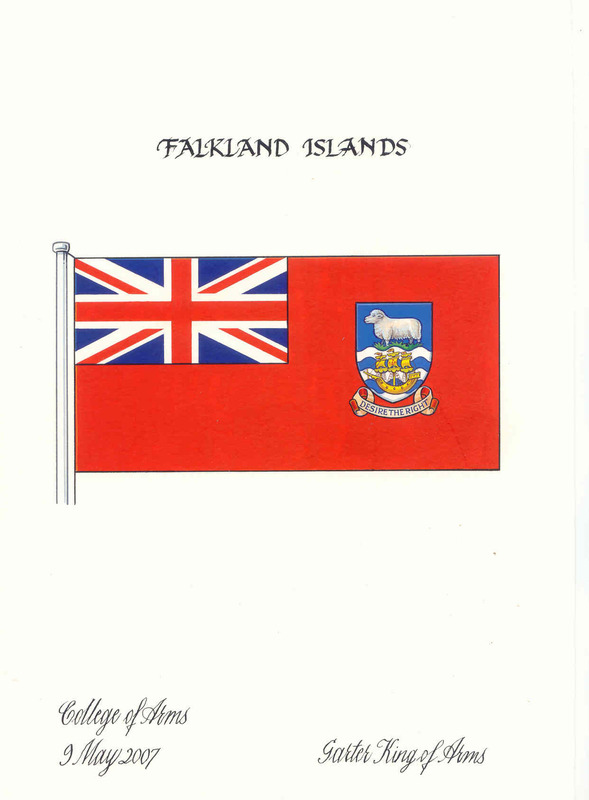 For example, in 1936 the Admiralty Flag Book of 1930 was amended with a new badge for the Falkland Islands based on the arms granted in 1925. However the arms were not popular, ("have no artistic merit,", "furnish occasion for critical levity,") and the old badge continued in use until 1948 when the 1925 arms were cancelled and replaced by the current arms. Orders in Council are part of the law of the land. The Ministry of Defence can only override them if this power is given to them in the order. Until April 1964 defacements for Red Ensigns were authorized by Admiralty Warrant. After the Admiralty became Ministry of Defence (Navy), Red Ensign defacements were issued by Royal Warrant. Under the Merchant Shipping (Registration etc.) Act of 1993, defaced Red Ensigns must be authorized by Orders in Council. The only Blue Ensign defacements that required a warrant were those for India and chartered companies. All other Blue Ensign defacements were considered to be for "ships belonging to Her Majesty" and thus did not require a warrant. It seems that the Ministry of Defence can amend and issue defacements of the Blue Ensign but not of the Red Ensign. I was working on the bases between 1953 and 1958. I recall that the RRS John Biscoe and RRS Shackleton flew a blue ensign with a slightly different form. There was no helm or crest and the "wavy barry" were a sort of Cambridge blue. The bases flew the Union flag. All the government and official buildings now fly the disc-less version with the larger arms, as promulgated by the MoD in 1999. I suspect that some private residences still fly the disc version. 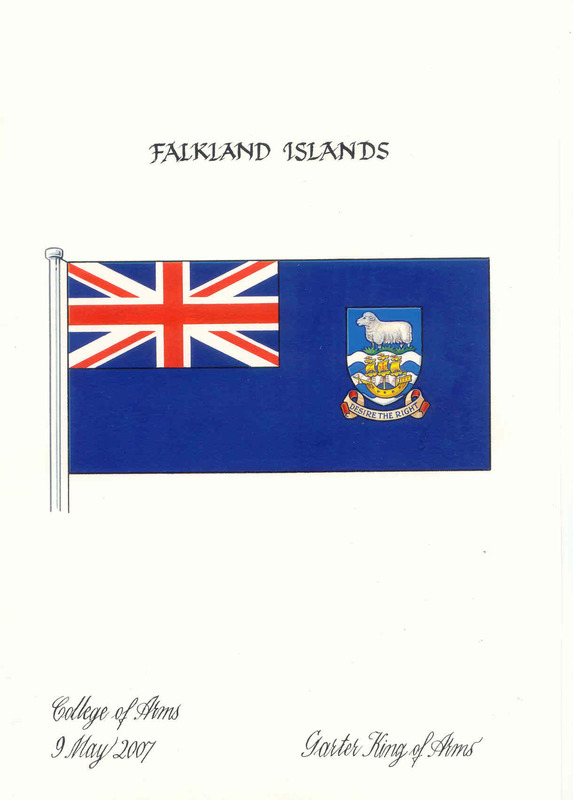 It is notified for general information that new designs for flags for the Falkland Islands - Red and Blue Ensigns - were approved by Her Majesty the Queen in July this year . Approval was based on new artwork supplied by the Garter King of Arms at the College of Arms in London and the approved designs have been entered in the appropriate book of registration at the College of Arms. The Crest used on the flags is the 1948 version. Copies of the relevant artwork are attached [blue ensign; red ensign]. Government departments will commence flying the new versions of the Blue Ensign as soon as supplies arrive in the Islands. The arms of the Falkland Islands are: 'blue chief with a white ram on a grass compartment over a blue and white wavy base bearing a Tudor style ship'. Before 1948, there was a bull in the badge, but since sheep-raising is the major activity on the islands, they changed it to a ram. The ship is supposed to be the Desire, the ship that discovered the islands in 1592, thus giving us the colony's motto 'Desire the Right', as it was written on a scroll at the bottom of it. The ship and the river are in the newer badge much more stylized. The ship's mainsail is "charged with four torts in cross", to quote the blazon shown on Wikipedia (https://en.wikipedia.org/wiki/Coat_of_arms_of_the_Falkland_Islands). However, Ralph Hartemink's site at https://ngw.nl/heraldrywiki/index.php?title=National_Arms_of_the_Falkland_Islands clearly shows these red objects as six-pointed stars. Question: is the blazon at Wikipedia correct? Are they torts or estoiles? The Falklands Islands government website appears to show them as stars: https://www.falklands.gov.fk/self-governance/the-falkland-islands-government/. A real picture of coat of arms here (behind the members of Assembly): https://upload.wikimedia.org/wikipedia/commons/3/36/Members_of_the_Falkland_Islands_Legislative_Assembly_%2830890771101%29.jpg also clearly shows stars when you zoom in on it. Boats and ships registered in the Falkland Islands are entitled to carry a special defaced red ensign. This is provided for in the Merchant Shipping (Falkland Islands Colours) Order, 1998, which came into force on 25 January 1999. The Falkland Islands red ensign was designed by the late director of the Flag Institute, Dr William Crampton, in spring 1996. "The positioning and proportions of the defacement shall be in accordance with the illustration in the Schedule hereto." The order does not give the Ministry of Defence the power to change the flag. Shortly after the Merchant Shipping (Falkland Islands Colours) Order, 1998 was issued I spoke to Mr A. K. Galloway, clerk of the Privy Council, who actually signed the instrument. According to him the civil ensign doesn't have a white disc on it. It's not mentioned in the text and, according to him, a white circle was only included on the black and white illustration as otherwise the arms would not have been visible, black on black. We talked about doing future statutory instruments in colour to avoid confusion of this sort. So the question of the circle is moot - officially it doesn't exist, and the Ministry of Defence doesn't need to get rid of it. The size of the badge is indeed specified, and the Ministry of Defence doesn't have absolute control over civil ensigns, sharing that honour with the Department of Environment, Transport, and Regions. In terms of blue ensigns the proportions of badges are within the Ministry of Defence's competency and can be changed by the Ministry of Defence without reference to anyone else. The actual badges are defined in consultation between the Ministry of Defence, Home Office, Foreign and Commonwealth Office and College of Arms. The Red Ensign defaced with the badge of the Falkland Islands was approved by Her Majesty 16th December 1998 and came into effect on 25th January 1999 (Statutory Instrument 1998 No 3147). I can add a little confusion to the discussion on the Falklands Islands Civil Ensign in FOTW. I asked William Crampton (who designed the flag) about the white disk some years ago (and fortunately took notes of his answer). William said that "he had given them the option of whether or not to place the arms in a white disk, and that they had chosen to do so". Whatever the person who signed the Order told Graham Bartram, the white disk appears to have been a deliberate choice, and whether the Schedule is in black and white or colour really doesn't make any difference because the wording of the Order is specific in referring to it. Article Two (the Schedule) shows a white disk 48% of flag width - knowing William it was probably intended as one-half. The Falklands Islands Colours Order was issued under powers granted by Act of Parliament, and placed before that body in proper form; it is therefore law. based on a badge by Graham Bartram and union flag by António Martins. The present defaced Union Flag flown by the Governor of: the Falkland Islands. One of my good friends from college days is (or was) Rector of the Falklands Islands (and hence chaplain to the Governor). He says that every year at the Queen's Birthday parade in Stanley, the Governor arrives at the parade ground as Governor, with his Governor Flag. However at the end of the parade, the Governor's flag is lowered and replaced with the Royal Standard and God Save the Queen is played, before again being lowered and replaced by the Governor's flag again. I was told that the thinking behind this was that for this brief period of time the Governor is there not as the Island Head of Government, but as truly the representative of the Queen and hence receiving the honours due to the sovereign. Constitutionally that might be an interesting question, but is anyone else aware of anything similar happening anywhere else? The British joint services flag used following the Argentine invasion. It is still in use and can be seen on the rank plates on the vehicles of some senior officers. The Arms with the seal is still in use as the cap badge and arms of the Falkland Islands Defence Force, who refused to change to the sheep one.